The Indian Wells Chamber of Commerce will be going dark for the month of January. We will back on schedule in February. See you then. 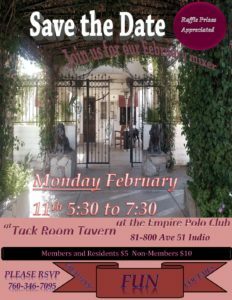 Please notice that this Month's mixer will be held on a Monday rather than the usual 2nd Tuesday of the month. The Chamber will not have a mixer in March. Please check back as we will announce the location of our April mixer here. The Indian Wells Chamber of Commerce will not have a mixer in the month of April. 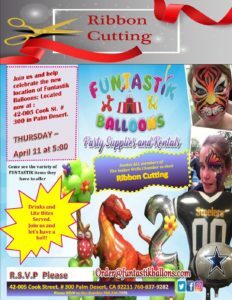 Join us for a mixer at the always fun Funtastik Balloons.